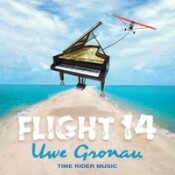 As he tends to do, Uwe Gronau keeps things brief and peppy on his new feel-good release, Flight 14. Twenty short pieces, most falling in the 3- to 4-minute range, are on the itinerary as Gronau takes off on a trip inspired in part by a vacation in the Bahamas, but also acting as a way to express the feelings brought on by the recent passing of his parents. This all plays out in a combination of smooth jazz runs, brief flirtations with prog rock, and introspective piano solos, making for a reasonably pleasant listen that, for me, does get a bit over-sweetened in spots. For the most part, however, I’m happy to settle in with Gronau’s toe-tapping pieces when the mood is right. I can dig into the title track, which chugs rhythmically along, punctuated in places with analog twiddle and big, Berlin School-pedigree bass twangs. “The Other Way” is a dose of super-smooth jazz on electric piano. The warm, round tones are comforting enough on their own, with a certain 70s-sitcom theme-song feel. Gronau lays them over quiet pads and the result is a few happy minutes of nothing but “Ahh.” For a pure smooth-jazz groove, look no further than “Night Train,” which features sultry sax from Matthias Keidel. Resist the urge to put on a silk bathrobe and chill some champagne, okay? Also of note on Flight 14 are the pieces where it’s simply (or mostly) Gronau and his piano. These pieces are clean and simple, and they showcase what I really enjoy about Gronau’s work. There’s a grace and charm to it, and it rings with honesty. The two “Magic Tree” pieces are charming songs, pure New Age piano pleasure. “Father, I Miss You” is appropriately emotional, beginning with rain-spatter arpeggios and ending on a slight hanging note, perhaps the essence of something left unsaid. The closing piece, “What I Forgot to Say,” with its speedy trills and runs, makes sure you understand that Gronau is a piano player foremost. Twenty songs is quite a bit to take in, and I do find that I prefer Flight 14 shuffled into a larger listen. Those whose tastes run a little lighter and zestier than mine may not have the same reaction. All in all, it’s a well made, pleasant album to kick back to–a mood enhancer from a talented artist. I don’t normally comment on art, but MBSpektral’s work plays nicely into the album’s feel. On the cover, as you see, there’s a piano being hauled into the sky. Inside, subtly, the piano is seen in the far upper right corner, parachuting down. Flip to the back, the piano is underwater, accompanied by a pair of surely curious dolphins. It’s fun.